Laurel Hill is an innovative, environmentally friendly company dedicated to producing the highest quality exotic handmade knitting needles, crochet hooks, and accessories at reasonable prices. We are a socially responsible company and our mission is to source and offer natural suistainable products from the U.S. and abroad that have a positive impact on our partners and their communities. Why just knit or crochet? Laurel Hill products can help create an ambiance of creativity, confidence and peace to enhance your experience. With our tools in your hands you can feel the weight and smoothness, hear the sound of the needles when the points touch, and enjoy the satisfaction of completing a challenging project. Laurel Hill respects independent retail yarn shops who educate the public and inspire the next generation of hand knitters. We exhibit at various industry Tradeshows and Conferences to learn more about the special needs of people who knit and crochet. With feedback from attendee’s and experts at these conferences, we have improved and developed innovative items. For example with suggestions from The Crochet Guild of America we developed a unique thumb rest for our crochet hooks that makes it comfortable for most folks and sets us apart from our competition. When knitters and industry leaders told us they wanted knitting needles for people who suffer from arthritis we helped develop four-sided and triangular needles. We continue to listen to our audience to improve and help develop new products. 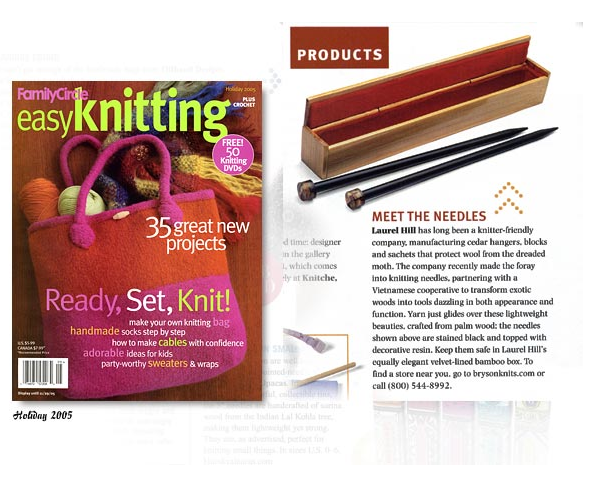 Our goal is to make the finest handmade knitting needles, crochet hooks and accessories at reasonable prices. Laurel Hill and our Vietnamese partners share a common artistic spirit, and together transform renewable, exotic woods into functional works of art. Our cooperative production facility is environmentally friendly and safe; all members are treated with dignity and respect. As part of an economic development coalition sponsored by Portland State University to develop small business, we made our first trip to Vietnam. After visiting many factories over a few years we found the right partner who shared our vision and started to manufacture private label knitting needles for others in the hand knitting industry. In the continual process of refining our skills and improving our products, we found Forest Palm wood. Attractive and structurally superior to the other woods we were using, we found it to be extremely flexible and a strong hardwood. It is easy to make a good shaft and point but is very difficult for the user to break or split. In summary, our experience making knitting needles for others has taught us that Forest Palm is simply the best material to make handmade exotic wood knitting needles. 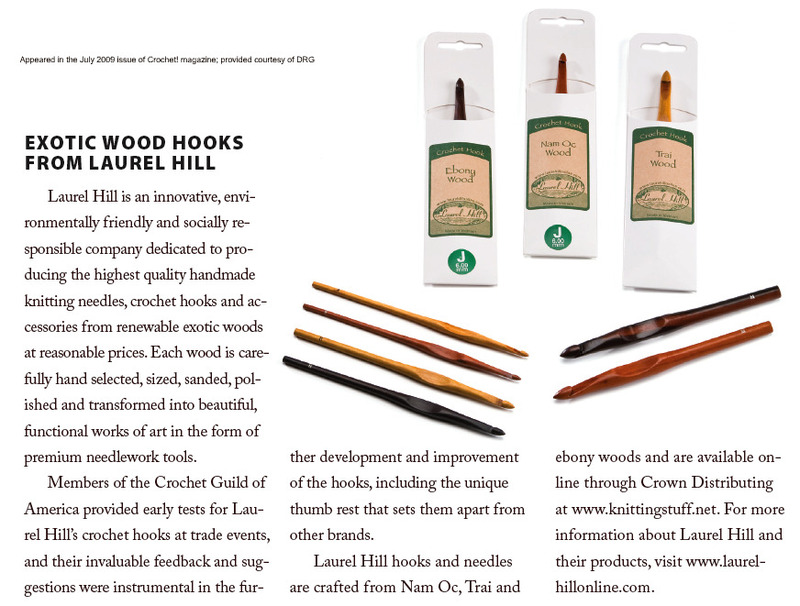 Now, we are offering our own line of Laurel Hill Forest Palm Knitting Needles at reasonable prices. We source all our exotic woods (Ebony, Nam Oc, and Trai) from furniture and musical instrument factories. We take only the small pieces of wood and reuse this recycled material to create beautiful handmade knitting and crocheting tools. Our Forest Palm comes from the lower part of the old branches of palm trees and is 100% recycled material. 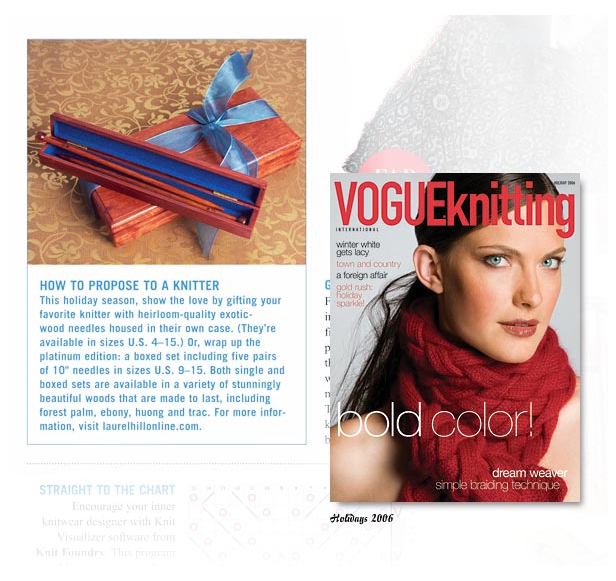 We are pleased you’ve chosen our products for your hand – knitting and crochet projects. If for any reason our products don’t meet your expectations, we’ll gladly replace or refund the item. For customer satisfaction testimonials, please read our testimonials. 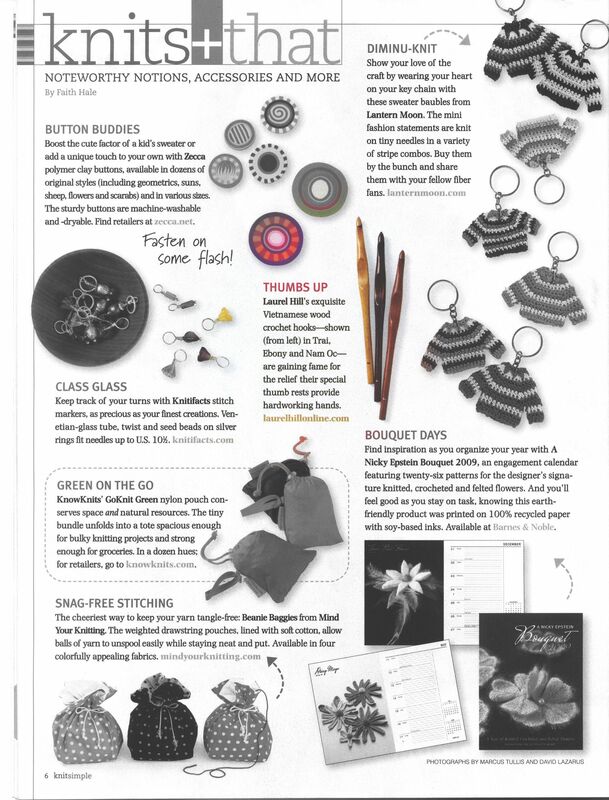 Laurel Hill manufactures private label Fiber Arts Tools and Kits for others in the hand knitting industry. To learn more about these companies please visit the links below. The exclusive distributor of our original Forest Palm crochet hooks. Knots of Love knitted and crocheted caps are given free of charge to people transitioning through the effects of chemotherapy or other life-threatening illnesses or injuries. 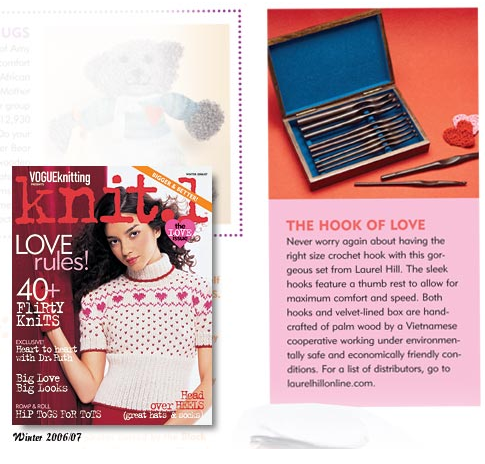 “I received my prize today… a lovely wooden crochet hook from Laurel Hill! I've been concentrating on learning how to knit and putting off learning to crochet. I think the crochet lessons, just moved up on my list. The hook is a lovely dark wood - ebony, I think. If feels lovely and is to light. I've just got to get a few WIPs out of the way before I think about starting something else new. View or download our Press Kit. Note: File size is 7.2 MB and will take 1-2 minutes to download.